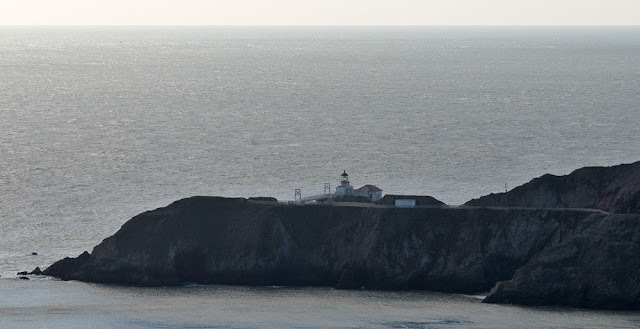 I was hoping to photograph the suspension bridge leading to the Point Bonita Lighthouse (at the extreme southwestern end of Marin County) in December. However, the tunnel to the lighthouse was closed and so I had to drive along the coastline to get a clear shot of the bridge. Unfortunately I only had brought a 24 to 120mm lens which limited the amount of detail I could obtain. I returned on Presidents' Day weekend but I had to fight crowds of revelers in order to find a parking space near the bridge and lighthouse. The current bridge was built by Flatiron Construction Company in 2012 and replaced a bridge built in 1954. The project had a number of challenges. The only access was through a 4 x 6 foot tunnel (see lower right corner of photo above). The bridge was constructed of dense hardwood from the Cameroon (because of its resistance to salt spray). The cliff that supports the bridge was reinforced with steel rods. The project cost $1.9 million and was paid for by the Federal Highway Administration. The bridge is a replica of the previous structure, a suspension bridge with timber 'A' frame towers supporting a timber deck and with asymmetric suspension cables anchored into the surrounding cliffs. No bridge was originally needed to reach the lighthouse when it was first moved to its current location in 1877. However, the cliffs slowly eroded. The US Coast Guard still maintains and operates the lighthouse horn and beacon. 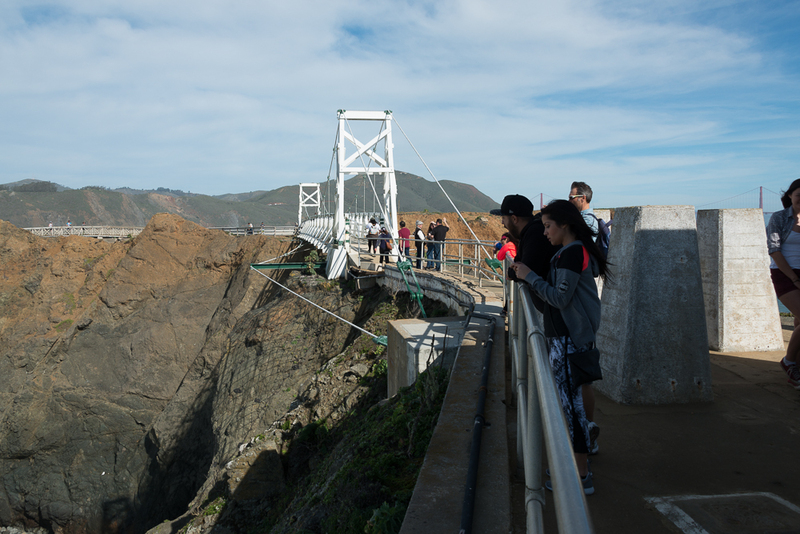 You can see the towers of the Golden Gate Bridge peaking above the heads of visitors in the photo below. Marin County, California Bridges: Point Bonita Lighthouse Bridge by Mark Yashinsky is licensed under a Creative Commons Attribution-NonCommercial-NoDerivatives 4.0 International License.